WASHINGTON (CN) – As President Donald Trump moves closer to deciding his choice to replace retiring Supreme Court Justice Anthony Kennedy, D.C. Circuit Judge Brett Kavanaugh reportedly remains on his short-list, alongside his fellow federal appeals court judges Amy Coney Barrett and Raymond Kethledge. Kavanaugh, a George W. Bush appointee who has served on the D.C. Circuit since 2006, has a detailed record on the bench and comes with experience refereeing the legal fights that figure to dominate the high court’s docket for the foreseeable future. Before joining the D.C. Circuit, Kavanaugh worked in the Bush White House, first as associate counsel to the president and later as Bush’s staff secretary. Kavanaugh also worked on Independent Counsel Ken Starr’s investigation into then-President Bill Clinton, helping to write the infamous report that led to Clinton’s impeachment. 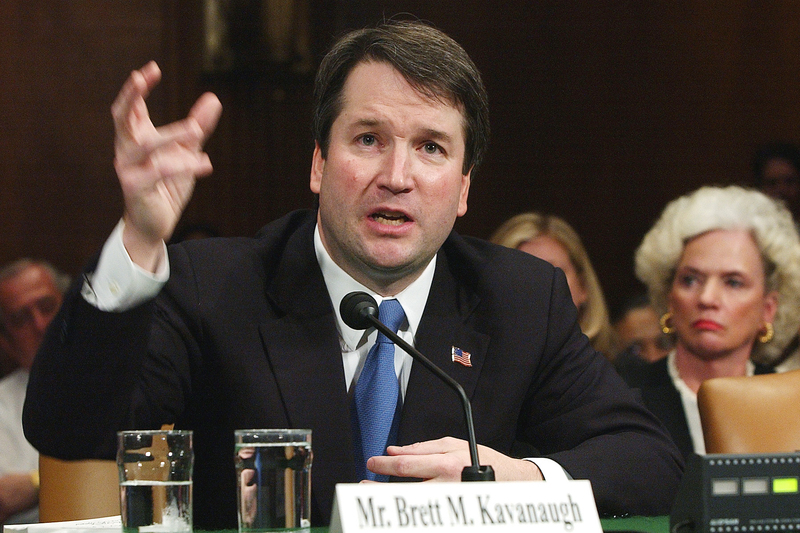 Kavanaugh clerked for Kennedy during the Supreme Court’s sitting beginning in October 1993 and also spent time at the Washington D.C., firm Kirkland & Ellis before joining the Bush administration. Like most of those who made Trump’s Supreme Court shortlist, experts say Kavanaugh comes into the process with strong conservative legal credentials. Carrie Severino, chief counsel and policy director for the conservative Judicial Crisis Network, pointed out that Kavanaugh’s time on the D.C. Circuit has particularly afforded him plenty of chances to rule on issues of administrative law. “I don’t think the American people had heard the word Chevron so many times before Justice Gorsuch’s hearings and if Kavanaugh is the nominee, I predict we’re going to hear some more of it,” Severino said in an interview, referring to the Supreme Court case that holds courts should give administrative agencies room to interpret vague statutes. With a decade of experience on the court that hears challenges to the web of administrative rulemaking that comes out of the various federal agencies in Washington, Kavanaugh has written opinions touching on issues from the EPA’s environmental regulations to the FAA’s drone registration requirements to the constitutionality of the federal health care law. In October 2016, Kavanaugh penned an opinion that held the president may remove the director of the Consumer Financial Protection Bureau at will, invalidating Congress’ original plan for the agency. Kavanaugh wrote that the agency’s initial structure, under which the director could only be removed for cause, essentially gave the director more power than anyone in the executive branch but the president. An en banc sitting of the court reversed that decision this January, with Kavanaugh filing a dissenting opinion that largely tracked with his original decision in the case. In the lengthy dissent, Kavanaugh wrote the agency is “unconstitutionally structured,” but that the problem could be fixed if the president could remove the director at any time. However, Ilya Shapiro, a senior fellow in constitutional studies at the Cato Institute, said Kavanaugh’s rulings in two challenges to the Patient Protection and Affordable Care Act could warrant red flags. In 2011 the D.C. Circuit upheld the constitutionality of Obamacare’s requirement that most people purchase health insurance or face a penalty. Kavanaugh wrote a narrow dissent in the case, agreeing with the court’s holding as to the constitutionality of the requirement, but arguing the court did not have jurisdiction to hear the case. In a separate 2015 challenge, Kavanaugh said he agreed with the majority of the D.C. Circuit that Obamacare complied with a constitutional requirement that all revenue-raising bills must originate in the House of Representatives. “Although the original House bill was amended and its language replaced in the Senate, such Senate amendments are permissible under the clause’s text and precedent,” Kavanaugh wrote. Shapiro said these opinions taken together could show “some sort of caution or not wanting to make waves” from Kavanaugh. “But generally he writes very ambitious, intellection dissents and concurring opinions and has a long record,” Shapiro added. Sen. Rand Paul, R-Ky., has reportedly expressed reservations about Kavanaugh’s nomination, raising concerns about his work in the Bush Administration, according to the Associated Press.